First off thanks for all your support to those who have sent messages regarding my latest incident (video of that here), and more on the blog here . Quite amazing as to how many that use the WeatherCam site have had serious knee injuries. It's quite shocking how many "sports" people do their ACL, in skiing it's unfortunately quite a common injury. I'm actually surprised knowing the nature of windsurfing & kiting that ACL injuries are not more common. There is so much out on the InterWeb about ACL injuries & subsequent surgery and then the months unable to do sport etc that in this thread I thought I'd highlight some of the stuff I did before if like me you do not have private health insurance and have to go down the NHS route. I went (privately) to see top knee guru James Lewis and he confirmed that I had torn both by ACL and Meniscus as well as the posterior aspect of the tibia stretching across the tibia from medial to lateral, almost what is known at the Unhappy Triad. I do not have private health care insurance so I was facing going down the NHS route and I knew that would take a fair number of months. To leap frog the system as it were, I suggested to my GP that I pay for an MRI, to do that he had to refer me, he thought that was a good move saving at least a couple of months as the NHS process would be, GP referral to Muscular Skeletal (3 or 4 weeks), who would then see me, only to refer me to Orthopaedics (3 or 4 weeks) who would then say I need an MRI (another 3 or 4 weeks). Vista Diagnostics in London charge £200 to £300 depending on how flexible you are, the Radiologists report is then sent to your referring GP though you get a copy of the disc with 144 images of your knee! GP then four days after rang me up to tell me the results, I then had to go and see him and we decided that I would pay to go to see the knee consultant, again jumping the system as it were. To be back being able to ski & windsurf as before…………..
1. That injury is only “Grade 1 or 2” and that I “might” be able to continue in the above sports (using a brace etc) after a period of rehab only to injure myself again due to the knee being weak. So should one opt for surgery anyway? Which is the better option and why – Patella or Hamstring in terms of recovery, flexibility and or best for someone of my age? If MRI scan does not show exact detail of injury and explorative arthroscopy confirms injury can ACL re-constructive surgery be carried out at the same time. How mobile could one expect to be, subject to no complications. So my concern that the Injury might only be Grade 1 or 2 (partial tear) was unfounded. That said if I was just a cyclist, walker etc then I could probably make do without an ACL as many people do, in fact some people do windsurf & ski without one relying on strong quads and leg muscles to hold their knee in place together with a brace. In answer to question 2, surgery is usually done within a couple of months from the stage I was at now, having leap frogged the system by at least two to three months. Going NHS is the above scenario, going private I might save a month but have to fork out nigh on £5k - something I would have considered doing if the NHS was 6 months. Operation will be an ACL re-construction so I have to prepare for that, so in advance carrying on with the cycling and some weights to strengthen the hamstrings. Post OP - I will be immobile for four weeks - this is to protect the hamstring graft more than the knee. This is the toughest period you face evidently, keeping the leg rigid at all times. Attempt to shorten this phase and that's when the problems can start, so I was told. After the four weeks so the rehab starts, and static cycling is the main process, leading on to light gym work. In answer to my Statement he said 9 months, I should just make the end of the ski season next year and be back windsurfing this time next year. 12th May MRI scan Confirms an anterior cruciate ligament rupture, a medial meniscal tear and early degenerative changes on the medial tibiofemoral joint. Received a copy of the letter sent by James Lewis to my GP. The last three paragraphs have the detail! On examination Full extension, flexes well, no effusion. He is stable to varus valgus motion. PCL is intact. Lachman +3 and pivot shirt apprehension positive. 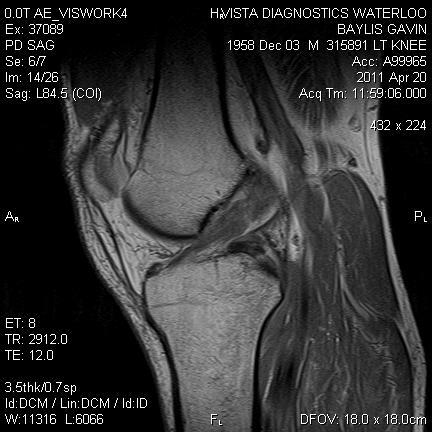 MRI scan Confirms an anterior cruciate ligament rupture, a medial meniscal tear and early degenerative changes on the medial tibiofemoral joint. Mr Baylis would benefit from anterior cruciate ligament reconstruction. He would like this carried out on the NHS and I have made the necessary arrangements. So hopefully I should hear soon re a date for the operation, he did say it could well be in June. Finally heard today about a date for my operation, July 14th (Bastille Day) was originally hoping for some time in June, but now have a big family wedding all of a sudden (niece has to get married prior to joining hubby working in Dubai) July 11th so maybe just as well. Have a pre-op June 10th. Heard last week that they've put my op back to August 25th - that is a real blow to any optimistic plans on getting back out to the Mountains (on skis) next year. As you know been doing a lot of miles on the bike, big ride this weekend (June 25th) and now with the op put back means I can go back out to the Alps with a mate for some cycling whilst he climbs mountains! Knee does feel good, but as soon as I walk downhill (grassy bank etc) feels none too good, and went to do some press ups and that really found a pressure point in my knee as the leg was suspended with the weight of my knee cap bearing down towards the floor! Heard from the hospital last week, still on for August 25th. So been doing loads of cycling, trying like mad to lower blood pressure and reduce cholesterol without having to go on any drugs. Amazing with all the fitness stuff I do that I suffer from high blood pressure and cholesterol but that's just the fault of my body, not mine according to the Doctor! Off to France August 7th for some cycling in the Alps and then back for 10days before I go under the knife. Back from France to find a letter putting the operation back to September 1st! Went for another pre-med check-up (August 17th) because of my severe White Coat Syndrome and resultant high blood pressure - but this time it was through the roof - bizarre considering what I'd been cycling up in the previous week! The anaesthetist had discussions with my GP and they agreed that the best course of action was to put me on beta blockers - so that's a bit strange - especially when cycling with a Heart Rate some 30 bpm down on my usual - still managed on Sunday to do one of the toughest cycling events in the South East the following Sunday even though I was running at about 25% off pace! So getting nervous now - only a week to go till I go under the knife! Elaine took me into Southlands Hospital Shoreham for 07:00 - and we went up to Amber Ward where I was shown my bed. So my name was on the system so it did look like it was going ahead. My blood pressure has been through the roof (even on beta blockers) with the anxiety of the operation. I was not worried about the actual operation but concerned that my high blood pressure would mean that they would have to cancel it, so in effect it was a vicious circle. The nurse took my blood pressure and again, it was something like 185 over 120 - so again I was worried that they would say it was too high. She said the anaesthetist would come to see me and discus. Once he showed up I was a little more confident that the op would actually happen after we'd discussed things, I did in fact tell him that once I was out the my BP & HR would probably drop like a stone, mind you it was not until I was in the actual theatre (o8:45) being given the drugs that I was confident all was about to happen. When I came to just after Noon I was naturally all over the place, so my memories are not too clear. When they (anaesthetic staff) eventually were happy that I was ok I was wheeled back up to the ward. What was then quite ironic was that all afternoon they were a tad concerned that my BP & HR were too low!!! As the drugs wore off so the pain came through, I tried to last out, but in the end I had to ask for something to relieve the pain. The physios came round and showed me how to hobble around on crutches, again all a tad ironic after the last couple of years with my various incidents. Tried to have a pee but was not happening. I sort of told a white lie how I had managed to pee so I could go home, however it was only after I had rung Elaine to come and get me did I suss out how stupid that was. The anaesthetic can affect people so they might feel that they want to go but they can't, and yours truly had quaffed a whole load of water, if I did discharge myself I could well be in the situation of having t o go to A&E later on with a full bladder but unable to go! So when Elaine did turn up (did try calling her) I had to explain so she had to go home and come back later. I eventually made it home at 20:30. That first night's sleep was good and I was not in too much discomfort. The next day I was surprised at how mobile I was and I even made it to the pub in the evening. The weekend also saw me out and about as well! In advance of the operation I managed to find on Ebay a Donjoy Post Op knee brace - this is so much better than a normal Velcro splint as you can adjust the angle of flexion and extension, so much easier to sit down. I also bought on Ebay an Donjoy Arctic Flow Knee Cooler and am icing my knee three times a day. The other great bit of kit as a pair of baggy MTB cycling shorts (minus the pad) these go over the brace and have loads of pockets for carrying various stuff around the house. Also have my back pack for carrying the ice cooler to and from the kitchen. In terms of pain I was only taking two coadamol twice a day and the anti inflammatories, after four days I'm weaning myself of them, though will carry on with the anti inflammatories as the swelling is still quite severe. Pretty well from as soon as being on crutches I've been able to put all my weight through the bad leg, and have managed to hobble around ok. I am surprised how mobile I am, maybe over doing it at the weekend as the swelling is still quite intense - so need to work at that to get it down. Well two weeks now post operation. Must admit to feeling a bit sorry for myself a times thinking is it all worth it as I lie awake at night with my knee feeling uncomfortable, and thinking how people have commented "Jeees Gav you've aged" or "You look really tired" as I fight the frustration of my current situation. But then I put a reality check in place and think how stupid I'm being as there are people far worse off than I! I'm how hobbling round the house without crutches, this time last week had some really intense pain around the bottom of my shin and nearly took myself to the Doctor, but after some Googling found out that it was fluids and blood from the swelling that had run down (via gravity) into the bottom of my leg, damn painful when standing up, getting out of bed. So been more of the same using the Cyro Cuff three times a day to reduce the swelling, and doing some light exercises to increase ROM (range of movement). Had my first Physio session yesterday, wee bit frustrating in that I have still yet to see my consultant (that's next Monday 19th Sept) so I'm none too sure as to what I should exactly be doing as different Doctors determine their own rehab procedures. So she gave me more exercises to do, and measured that I have 80 degrees of flex - so not too bad. Elaine has taken me out a couple of times up to the Cafe, where I've sat watching mates out kiting and windsurfing, and of course have managed to get out to the pub on a Friday night! So will hopefully be in a more positive state of mind after seeing the consultant next week! Knee Status - saw my operating surgeon on last Monday (Oct 3rd), and he confirmed that I did need more physio to get the knee more flexible. The dear old NHS resources are just not up to focusing on that type of rehab. Now back to walking the dogs up to the Cafe and light spinning on the static bike, but a very very long way to go! Knee Status - might have over done it a little this week as I'm now getting some pain behind my patella - my physio has been away for a couple of weeks so not too sure if it is something I've done, or its realignment issues with my patella as I build my quads back up? I have been pushing it quite hard on the turbo, though seated and not getting out the saddle, as well as hacking it hard on the stair master. Plus have started leg presses as well, she'll probably flip when I see her on Monday! I've booked myself in (Nov 23rd) for some key hole surgery to the other knee as an MRI indeed confirmed that I have a tear to my medial meniscus - so might as well get it all sorted in ever I want to run back up on The Downs again! Knee Status - had the key hole surgery to the other knee done on Wednesday 23rd and all went well on the repair though had a bit of a shock to be told that at some point in my past I had evidently managed to tear my ACL in that knee as well - news to me as I'm sure if it was anything like my left knee I would have know about it! Video shows explains it all rather well, with the ACL bombshell at around 05:10 into it !! Have also succeeded in ripping my back twice now doing lunges - was just getting better after the first time when I did it again, so wee bit depressed. This was never going to be a walk in the park! Have not see Sarah my phsyio for a couple of weeks as we though that post op on my other knee we might as well wait. However aprat from the back still playing up which is holding me back a little, legs were feeling good and ended doing a couple of ten minute jogs on the tread mill and then ran for twenty minutes but then the next day both knees let me know that maybe that was not such a good idea. So have been continuing with stretches, on the machines and wobble boards etc. Nick an Osteo mate who runs his clinic in Emsworth was over and beat me up big time on my calves and quads, and did feel better afterwards! Off to the mountains for the New Year but will not attempt any skiing - just walking and that I will take very carfeully! That said did one longish walk up and down some steep single track and knee didn't feel too bad, also helped by have some ice grippers on my boots, in fact every one was using snow shoes, but they'd bashed it down so much boots were ok. So started off at a point where we used to do a lot of cross country runs / races. Route we did starts with a long 1.5 ml hill, quite steep at times up to Cissbury Ring and then down and up the Southern side, which has a couple of short sharp steep climbs and then the long run back downhill to the start, 4 miles in total. I was wearing my trail shoes which are the running version of a snow tyre, as the chalk can be very slippery and pleased to report that my ACL op knee felt really good, in fact it was the other one on which I had keyhole a month or so ago that was complaining a wee bit. Later on in the day I did 40 mins on the turbo to loosen up the quads. Then the big test was always going to be how the legs would feel the next day, and there were a few niggles but as it was another super day after the dog walk we went up again, this time with my uber fit cycling mate and his two mad Springers - we're always quite competitive together and going up the hill I put the hammer down and reached the top hitting 178bpm - running fast going downhill as well, though towards the end there were some aches coming from the ACL knee but really only around the IT band on the outside of the knee. Once back home put the cyro cuff on and then later on half hour spinning on the turbo. So quite chuffed with being able to run like that. I always have said that I will not go back on skis until I can run confidently downhill off road and I've done that two months before I'm back out in the Mountains. Saw me mixing it between the gym and the turbo. Think it was Tuesday after the weekend runs above, that I messed up, went on to the tread mill to do 10km and started off way to quickly, went through the first mile in 07:15 and then eased the pace back to 08:00 and at 3.5mls felt a nasty twinge in the calf of my ACL leg and hopped off the treadmill immediately. Next day calf was really stiff / sore so powerplates and stretching and some light cycling, and even had a day off Friday! On the Saturday 14th Jan felt good enough for a run up on the Downs upped the distance to 5.5mls, with a nice hill at the start that more or less goes up for some 3.5 mls to Chanctonbury ring atop the South Downs outside Worthing. Conditions were superb with a really heavy frost, clear blue sky and mist down below the North escarpments near where the river Adur slices through the Downs. So pleased to be out there...........was trying to concentrate on running lightly on the feet especially downhill. Then passed on running the next day and went out on the road bike heading off into a stiff cold E'ly breeze, up over the Downs heading over towards Brighton & Devils Dyke criss crossing the Downs getting some vertical in. Plan for this week - couple of gym sessions, bosu ball / powerplates / leg machines maybe one tread mill session or Downs run and one mid week long ride, along with some turbo session, and then Sat Downs run distance 7mls or so. Might kick the gym into touch for Feb and go back to Bikram for the final month before heading off in March. Current thinking is that I'll take one day at a time, and probably do Alpine one day, rest the next doing xcountry / cycling - all depends on the conditions and obviously the knee!